STORYLINE : In S1 E4, after a motorway pile-up, involving two men, driver John and Andy, in a lorry, and a couple, Derek and Lindsay in a car. The men suffer minor injuries, but the couple both die. Surgical Registrar, Rupert Thalton, who Baz dislikes, is keen to take the organs from the woman. 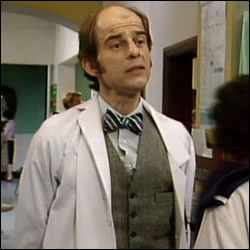 In S1 E7, Mr McFarlen comes in with abdomen pains, Baz calls Thalton down on Clive’s recommendation, as she hasn’t had time to look at him herself. But Thalton is annoyed, when he wasn’t needed, as his ulcer was not perforated and didn’t need operating.